[How to] Convert Ubuntu into ChromeOS (kinda) - OMG! Ubuntu! Whether the hype surrounding Google’s soon-to-launch ChromeBooks has left you wanting a piece of the action, or whether you’d just rather have a “quickboot” interface for Ubuntu that gets you on the web in seconds, the following ‘conversion’ guide may prove useful. 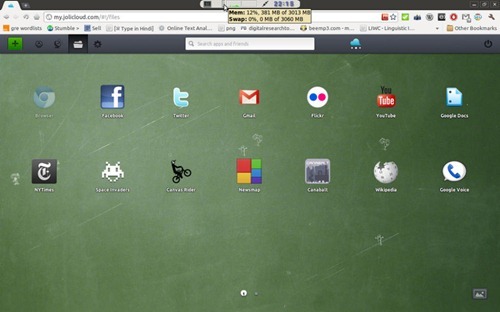 Chrome OS is, in the simplest of simplistic terms, a browser running atop a Gentoo base. Not as fancy as one might have expected, nor is it that difficult to ape thanks to a great many of ChromeOS’ features being features within the browser itself. Tutafuta – which my mind insists on reading as tooty-fruity for some insane reason – have put together a neat how-to on transforming Ubuntu into a ChromeOS-style environment. The result is by no means a perfect match – features, usability and speed from power-on to google-dot-com will be noticeable between the OS proper and this make-shift version. But that’s missing the point. This is about getting some of the best bits of ChromeOS atop a more powerful, accommodating base such as Ubuntu.